For intrepid travellers wanting a mesmerizing glimpse of Thailand's natural wonders, Krabi is the place to go! There's plenty of amazing experiences to take in over several days, from hot springs and elephant treks, to rock climbing, kayaking, and much more. Unlike other parts of Thailand, this is a charmingly quiet town that isn't a stomping ground for partying tourists. 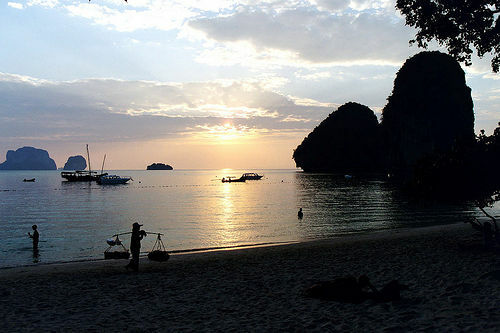 Instead, Krabi holidays, available through providers such as Thomson, are serene and tranquil. Get out and about in the evening for the Thai night market, where there's amazing street food, bric-a-brac and souvenirs to haggle for. Klong Thom hot springs are nature's own jacuzzis, filled with mineral water straight out of a volcanic chamber. It's a wonderful way to wind down and get rid of the aches and pains of your adventures. The water is a cosy and toasty 35 to 40 degrees Celsius and you can take a dip in the cool river below afterwards. There's large man-made baths at the same site, along with changing facilities and toilets. Another possibility is doing a jungle trek through the Koranee National Park. There are ancient caves in the park that can only be accessed on foot or by kayak, where prehistoric paintings of figures and animals can be found on the walls of Tham Phi Hua. It's an eerily beautiful experience for anyone who visits. The labyrinthine and lush rivers and waterways in Krabi's jungle make it perfect for exploration by kayak. Try the Borthor area, where you could easily spend a whole day paddling through the salt water river, among twisted mangroves and peering at the limestone mountains above. It's also possible to kayak through a cave tunnel in the Koranee National Park. With a soundtrack of silence and the occasional drip, drip of stunning stalactites and stalagmites around you, it's as strange as a lunar landscape. The regal and intelligent elephant is a symbol of the Thai people. Sadly, their habitat is quickly disappearing, leading them to be kept in establishments or animal camps either close to the jungle or near rubber plantations. Such establishments must follow strict guidelines set by the National Livestock Department for food, water, healthcare and shade for the elephants. Make sure that when planning a visit to one of these camps, you make sure you are visiting one that treats the elephants humanely. Some of the most dramatically beautiful limestone cliffs and caves can be found in Krabi. Naturally, rock climbers all over the world gravitate towards the place. There's something to excite new climbers - a three-day course is available so that newbies can get a hold on the basics - and more serious athletes alike. No matter what itinerary you decide on – Krabi holidays are filled with bewitching scenery and adventure.